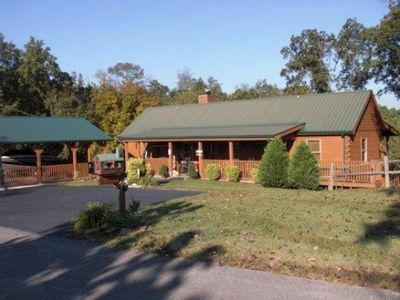 6.5 acres with 1500 ft. of lake frontage. 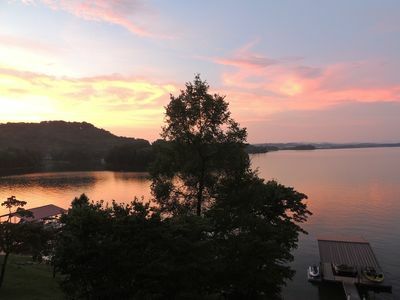 This one of a kind Lakefront property has 2 homes- that can be rented together or Separate (based on season) with a beautiful park like setting. 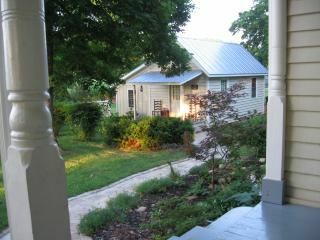 The Lodge sleeps 15 has a large living and dining room, the kitchen is fully equipped with an Island and bar stools for entertaining. 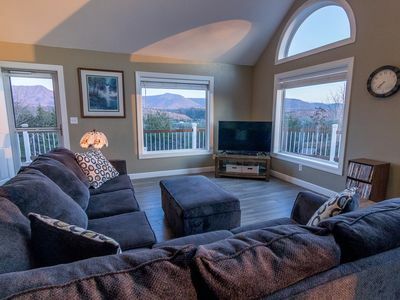 The Living room has a stone fireplace and wall to ceiling glass overlooking the lake. There is a large flat screen TV for everyone's viewing pleasure. A half bath and laundry room as well as a foyer are found off of the kitchen. 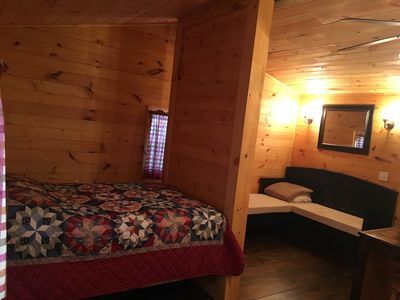 The main level master bedroom is very spacious and features a king log bed, lots of windows facing the lake, fireplace, sitting area with a futon, Large TV with satellite and DVD. French doors with a private entrance to the Hot tub and deck overlooking the lake. The Master bathroom is Awesome!. 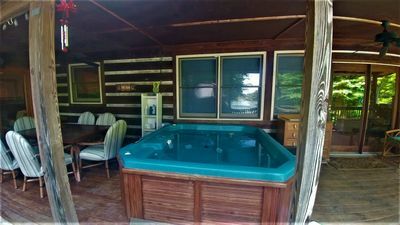 There is a large double sink, private toilet room, SAUNA, huge walk in shower with 3 separate shower heads, and 6 foot Whirlpool Tub. The walk in closet is as large as some people's bedrooms. 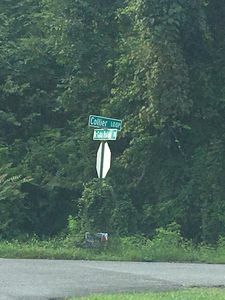 Just wait till you see it, you just might want to move in permanently! A 2 car garage has been converted into a large game room with Foosball table, Pool table and sitting area with a flat screen TV as well as an extra refrigerator. Upstairs you will find another massive room that has 3 log queen beds, a lounge area with a sleeper sofa and TV with satellite and DVD. 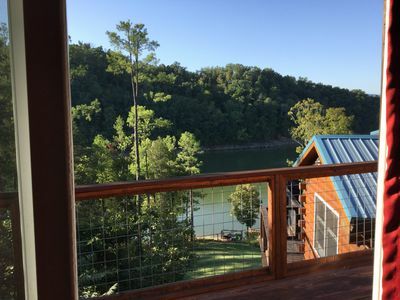 There is a deck off of this room and a Terrace that overlooks the lake with a mountain view. Additionally, there are 2 bedrooms with hand painted walls. 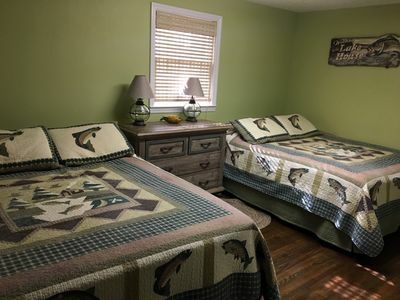 The Butterfly room has a double bed and the Dolphin Room has a queen bed. This room will be great for kids and teens. There is a full bath between the 2 rooms. 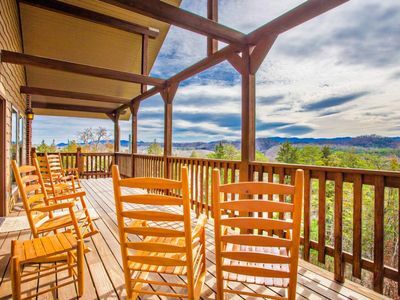 On the main level you will find a deck that goes the entire length of the home with a gas grill and a hot tub. 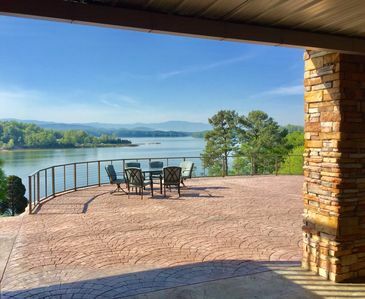 Hang out with family and friends while enjoying the view of the lake! 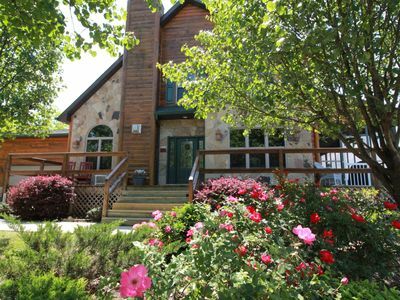 Lakefront Lodge is luxury on the lake! 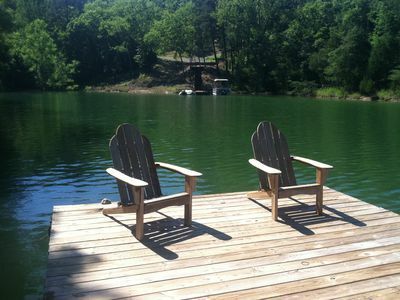 The property also has a Gazebo at the lake with a sandy beach area! it makes you feel like you are at the beach! 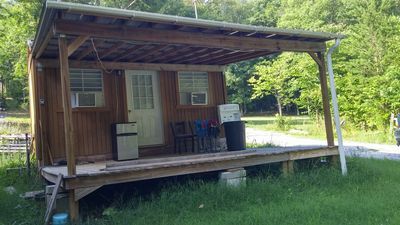 it also has a gas grill, Stereo to enjoy music, fire pit, swinging bench, boat dock and horseshoe pit...enjoy grilling at the lake with a picnic and a bonfire! On 1500 ft of lakefront!! The property also features a covered boat pavilion for guests use. 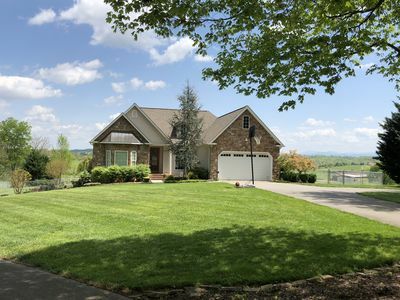 The Chalet: Sleeps 8 -This one level ranch style home offers the comfort and coziness of home, it features 3 bedrooms and 2 baths with log furniture. 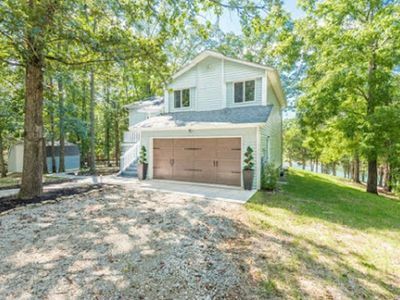 A fully equipped kitchen and a living room and a large back deck facing the lake, the lake is so close you can cast your fishing pole from the deck! 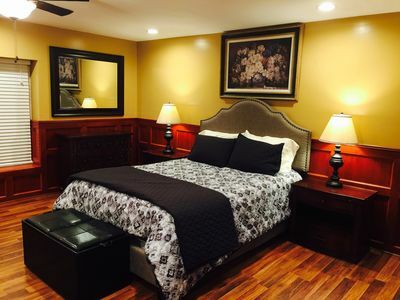 The Master bedroom has a private bathroom and a flat screen TV. There is 2 boat docks on the property, one for each home. It also has a Jet ski Dock for 2. 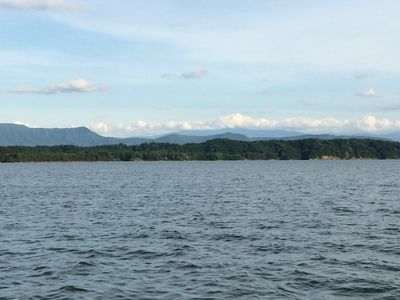 Have a fun and relaxing Vacation....Picnicking, Swimming, Boating, Fishing, Jet skiing and so much more on Douglas Lake! 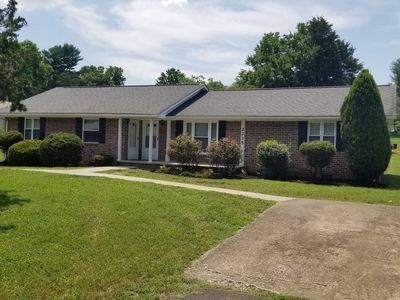 This property offers it all! Our Pet Policy: Dogs only allowed. 15lbs or under , non-shedding. $50.00 non-refundable pet fee per dog applies. 2 dog maximum. No dogs allowed in Lodge. allowed in the Chalet only. Pet waste to be disposed of properly in the waste bin provided on the property. We ask that the dogs be up to date with their vaccinations, as well as flea and tick treatment. At the time of arrival any dogs without prior approval, there will be an additional $100.00 non refundable pet fee for each dog. It is unique and one of a kind with a serene park like setting and very quiet. Its a lakefront retreat. It is so Relaxing, Peaceful and Beautiful it makes you feel like your at your own private lake front resort. Peak Season: 5/1 thru 9/15 together only. both are a 4 night minimum. 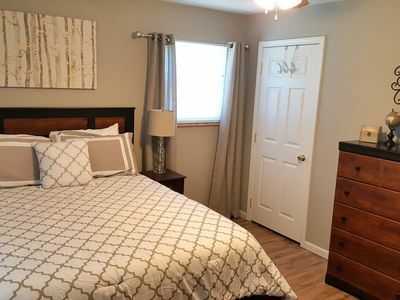 Cozy basement large studio suite with private access - New listing! 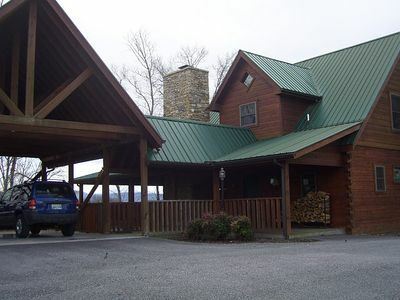 Easy Access Smoky Mountain views, fire pit, hottub, arcade,& pool table.